"I" by Black Sabbath. Because it's all about the power of one: "I am anger," a rebel, a holy outlaw. Favorite line, "all together, you'll never be stronger than me." Of the things I've wanted but I never could find." "Shadow on the Sun" by Audioslave. Another epic song. Is It Real by The Seatbelts (ROTS). Weight of the World by Evanescence (mostly in regards to "freefall, freefall, all through life" vs. "freefall in the dark". #ROTS novelization. But that aside, it really does fit Anakin/Vader's story). Blackbird by Evan Rachel Wood: Mostly picking the cover version from ACROSS THE UNIVERSE just because of the emotion in it -- and Anakin's story is very, very angsty, to put it mildly. Ghost Love Score by Nightwish -- Him and Padme. I hadn't heard those songs before. I want to add "Eyes of a Stranger" by Queensryche: "How many times must I live this tragedy? How many more lies will they tell me? All I want is the same as everyone. Why am I here, and for how long?" 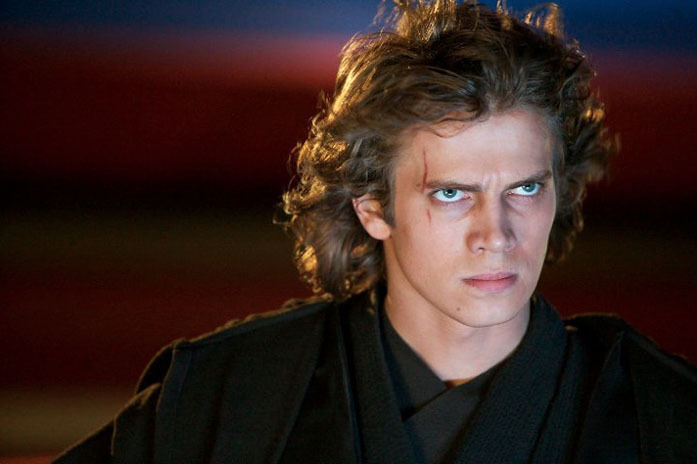 Really, many metal songs lend themselves to Anakin's mythic tragedy! Also, I'll admit that I've been listening to a lot of Garbage, and something about the songs really seems to capture Anakin perfectly. "You Look So Fine", for example. Also "Happy Home", "Cup of Coffee", "Milk", "So Like A Rose", "#1 Crush" and "Vow". Since I am an older fan, I think the song "Hero" by Mariah Caray fits perfect. If you want a song about Anakin and Padme's love for each other two songs come to mind, "In Your Eyes" by Dan Hill and the song by Kenny Loggins "For The First Time". The singer Jeffrey Osborne also came out with "In Your Eyes" and personally I like this version better. The Garbage lyrics are intense - and are a great match for Anakin's story. Here are more random songs: Search and Destroy by Iggy Pop and the Stooges; Blood Red Skies by Judas Priest (the duel with Obi Wan); and even Running with the Devil by Van Halen. Soundtrack-wise, the Gladiator score is a good fit, although I love John Williams work. The Weird Al song is great and so is a Yoda one he also did. I don't remember the lyrics to it. I agree - Weird Al is great, and his songs about Star Wars are funny and show he's a real fan. I think the song "Behind Blue Eyes" by the Who fits almost perfectly "No one knows what it's like, to be the bad man, to be the sad man, behind blue eyes." MY favorite song that fits Anakin is "There's No Way" by Alabama. It reminds me of his love for Padme. Only you by Selena Gomez. It reminds me of anakin and padme. I can't stop listening! I wanna see a tribute video with it!